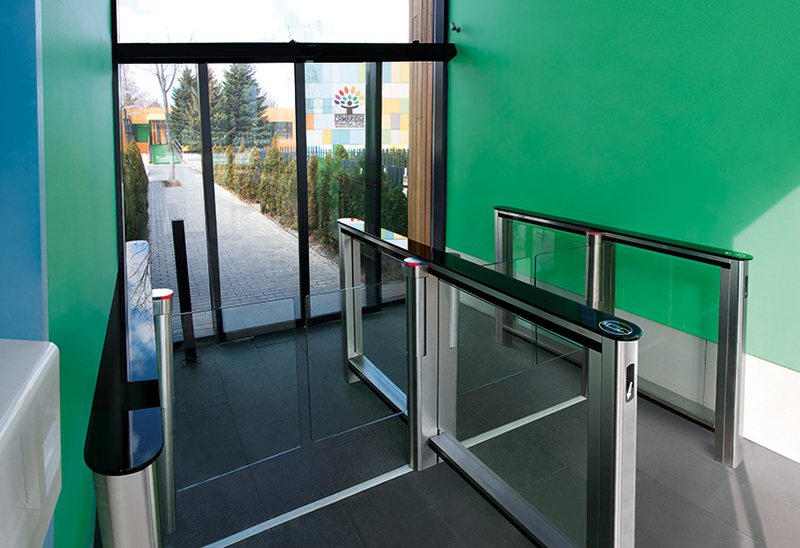 Our aesthetically pleasing range of pedestrian speed lanes are the ultimate solution for control of pedestrian access, offering a high level of security, speed in operation and anti-tailgating benefits of a physical, traditional turnstile but without the need for a manually operated turnstile arm. Each lane is designed to allow access to up to 60 people per minute in either direction and multiple lanes can be installed side by side by means of double sided intermediate pedestals to enhance throughput on particularly busy entrances. When a valid card is presented the illuminated, clear gate paddles open in less than 1 second to allow access. The users movement is then monitored through the lane by several built in photoelectric safety beams – as soon as they have passed through the lane, the glass paddles return to the fully closed position just as quickly. The photocell beams can also trigger an alarm tracking system and visual indicator if a person attempts to pass through the lane or jump over the paddles without first presenting a valid card. The alarm also activates if someone attempts to pass though the lane in the opposite direction to that which access has been granted. With 14 intrusion detectors in the upper level and 28 in the lower level, security is guaranteed even at a high throughput rate. Protection is also provided against unauthorised personnel simultaneously passing through i.e. tailgating. Each speed lane pedestal is manufactured from high quality stainless steel and comes complete with passageway direction indicators built in to the end of each lane, along with a flush mount toughened glass panel to allow proximity card readers to be seamlessly integrated within the units. Every speed lane system, installed by Auto Mate Systems Ltd, can be connected to the building fire alarm system to automatically open and allow unrestricted access in the event of an emergency. In the event of a sudden power loss, the controller retains enough power to automatically retract the gate paddles to allow safe access. 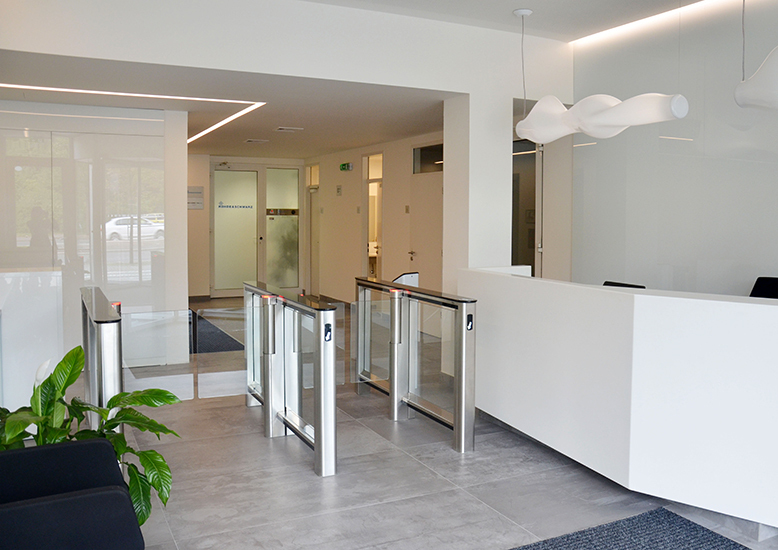 For a complete entrance solution we can also install automatic glass swing gates alongside the pedestrian speed lanes, for DDA access or delivery of bulky items – along with matching stainless steel and toughened glass balustrade infill sections in site specific sizes or designs.